This comes from a set of photocopies that has been making the rounds recently amongst collectors. 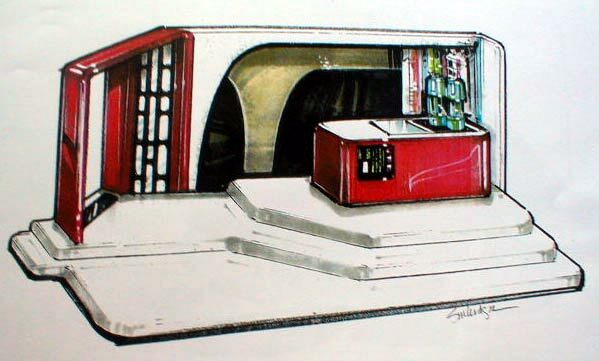 It's a copy of the original design sketch for the Creature Cantina playset. It was probably the basis for the oddly-colored prototype featured in early Kenner promotional literature. The toy as it's depicted here is vastly different from the one that was eventually produced. Not only are the colors different from the orangish-yellows of the production toy, the backdrop is unique, as are the plastic forms of the "bar" and base.